CCl4 is a well-established hepatotoxin inducing liver injury by producing free radicals. Exposure to CCl4 also induces acute and chronic renal injuries. The present study was designed to establish the protective effect of hesperidin (HDN), a citrus bioflavonoid, on CCl4-induced oxidative stress and resultant dysfunction of rat liver and kidney. In conclusion, our study demonstrated a protective effect of HDN in CCl4 induced oxidative stress in rat liver and kidney. This protective effect of HDN can be correlated to its direct antioxidant effect. Drug exposure, ionizing radiations and environmental pro-oxidant pollutants induce free radical formation. Lipid peroxidation initiated by free radicals is considered to be deleterious for cell membranes and has been implicated in a number of pathological situations. Carbontetrachloride (CCl4), an industrial solvent, is a well-established hepatotoxin [1–3]. Various Studies demonstrated that liver is not the only target organ of CCl4 and it causes free radical generation in other tissues also such as kidneys, heart, lung, testis, brain and blood [4–6]. It has also been reported that exposure to CCl4 induces acute and chronic renal injuries [7, 8]. Case control studies and various documented case reports increasingly establish that hydrocarbon solvents produce renal diseases in humans . Extensive evidence demonstrates that as a result of the metabolic activation of CCl4, •CCl4 and •Cl, are formed which initiate lipid peroxidation process. Vitamin E protected CCl4-induced liver injury indicating the role of oxidative stress in this model . Studies also show that certain natural extracts containing antioxidants protect against the CCl4-induced increased lipid peroxide levels and impairment in hepatic GSH status . Hesperidin is a flavanone glycoside abundantly found in sweet orange and lemon and is an inexpensive by-product of citrus cultivation . Hesperidin is effectively used as a supplemental agent in the treatment protocols of complementary settings. Its deficiency has been linked to abnormal capillary leakiness as well as pain in the extremities causing aches, weakness and night leg cramps. Supplemental hesperidin also helps in reducing oedema or excess swelling in the legs due to fluid accumulation. A number of researchers have examined the antioxidant activity and radical scavenging properties of hesperidin using a variety of assay systems [13–16]. Thus the present study was designed to investigate the effect of HDN on CCl4-induced oxidative stress and resultant dysfunction of rat liver and kidney. CCl4 caused a marked rise in serum levels of ALT (control = 45 IU/L) and AST (control = 135 IU/L) demonstrating a marked liver damage. Treatment with HDN decreases the elevated levels of ALT and AST in serum (P < 0.05)(Table 1). Both the doses of HDN also attenuated the CCl4-induced elevated levels of total bilirubin (control = 0.184 mg/dl). Effect of different doses of Hesperidin on CCl4 induced rise in AST, ALT and total bilirubin. CCl4 challenge caused a marked lipid peroxidation in both liver (control = 1.5 micromoles/mg protein) and kidney (control = 33.86 nmoles/mg protein). Both the doses of HDN decreased the level of lipid peroxidation in liver, but in the kidney, no effect on lipid peroxidation was seen with 100-mg/kg dose, and only the higher dose of HDN (200 mg/kg) could attenuate the increased level of lipid peroxidation (P < 0.05) (Fig 1). 7-day oral feeding of HDN per se (200 mg/kg) did not result in a significant alteration of either hepatic or renal TBARS levels. 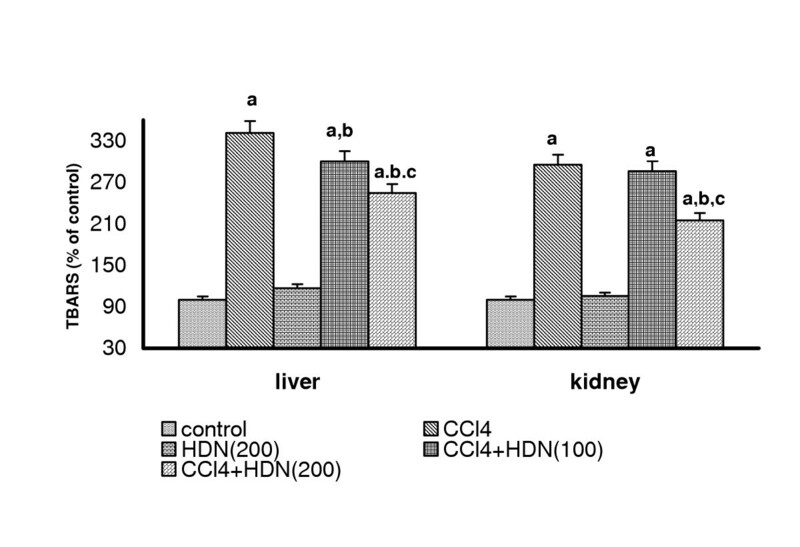 CCl4 administration markedly decreased the levels of reduced glutathione in both the liver (control = 35.99 micromoles/mg protein) and kidneys (control = 27.99 micromoles/mg protein) demonstrating oxidative stress. HDN (200 mg/kg) per se did not produce any change in the levels of reduced glutathione either in liver or kidney. 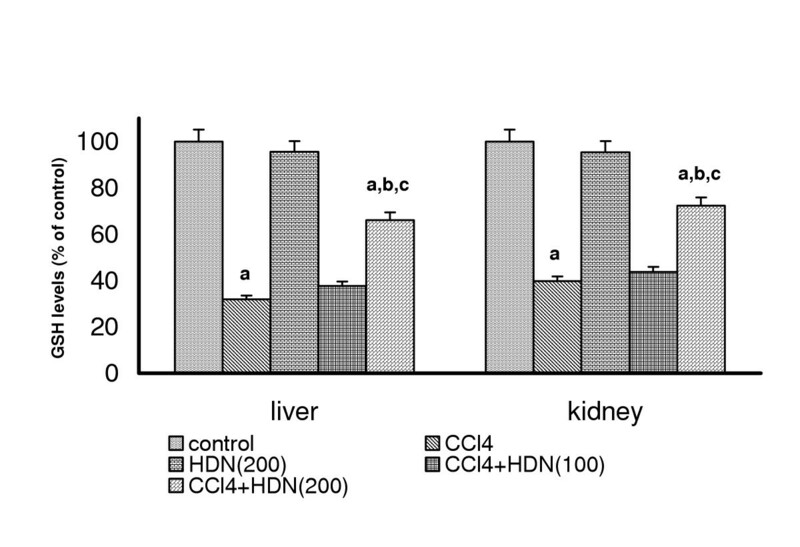 HDN (100 mg/kg) showed no effect on the levels of reduced glutathione either in liver or kidney in CCl4 treated rats whereas HDN (200 mg/kg) significantly ameliorated CCl4-induced depletion of GSH in both liver and kidney (P < 0.05)(Fig-2). HDN per se (200 mg/kg) did not result in a significant alteration of either hepatic or renal GSH levels. CCl4 challenge significantly decreased the levels of SOD and catalase in both liver (SOD: control = 25.66 U/mg protein; Catalase: control = 0.32 K/min) and kidneys (SOD: control = 99.22 U/mg protein; Catalase: control = 0.32 K/min). 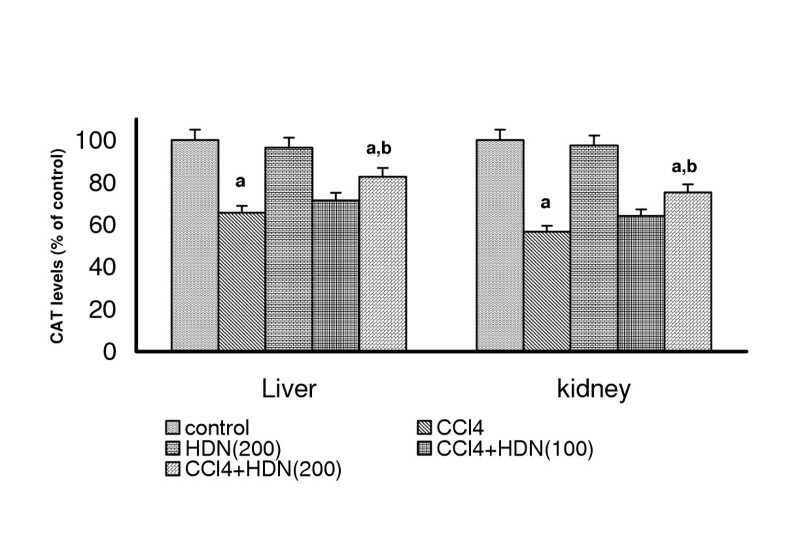 HDN per se (200 mg/kg) had no effect on these enzymes either in liver or in kidneys. HDN (100 mg/kg) failed to improve the levels of SOD or catalase either in liver or kidneys of CCl4 administered rats but HDN (200 mg/kg) significantly increased the levels of both enzymes in liver and kidneys of CCl4 treated rats (P < 0.05)(Fig-3 and 4). 7-day oral feeding of HDN per se (200 mg/kg) did not result in a significant alteration of any of these antioxidant enzymes either in liver or kidney. CCl4-induced lipid peroxidation is highly dependent on its bioactivation to the trichoromethyl radical and trichloromethyl peroxy radical [17–19]. It is well known that CCl4 is activated by the cytochrome P450 system. The initial metabolite is the trichloromethyl free radical, which is believed to initate the biochemical events that ultimately culminate in liver cell necrosis[20, 21]. The trichloromethyl radical can form covalent adducts with lipids and proteins, interact with O2 to form a tricholoromethyl peroxy radical or abstract hydrogen atoms to form chloroform . Other products include conjugated dienes, lipid hydroperoxides, malonaldehyde-like substances, and other short-chain hydrocarbons [23–25]. In response to hepatocellular injury initiated by the biotransformation of CCl4 to reactive radicals, "activated" Kupffer cells in liver respond by releasing increased amounts of active oxygen species and other bioactive agents . Protective effects of various natural products in CCl4 hepatotoxicity have been reported . Studies done with Ginseng showed that the antioxidant property of ginsenosides contributes to protection against CCl4 induced hepatotoxicity in rats . In the present study, CCl4 induced a severe hepatic damage as represented by markedly elevated levels of ALT, AST and bilirubin coupled with a marked hepatic oxidative stress. CCl4-induced generation of peroxy radicals and O2-• leads to inactivation of catalase and SOD. We too observed that CCl4 challenge significantly decreased the levels of SOD and catalase in liver and kidney. Recently, Szymonik-Lesiuk et al  have shown that CCl4 intoxication can lead to alteration in gene expression and depletion of SOD and catalase levels in kidney and heart. Oxidative stress causes depletion of intracellular GSH, leading to serious consequences. 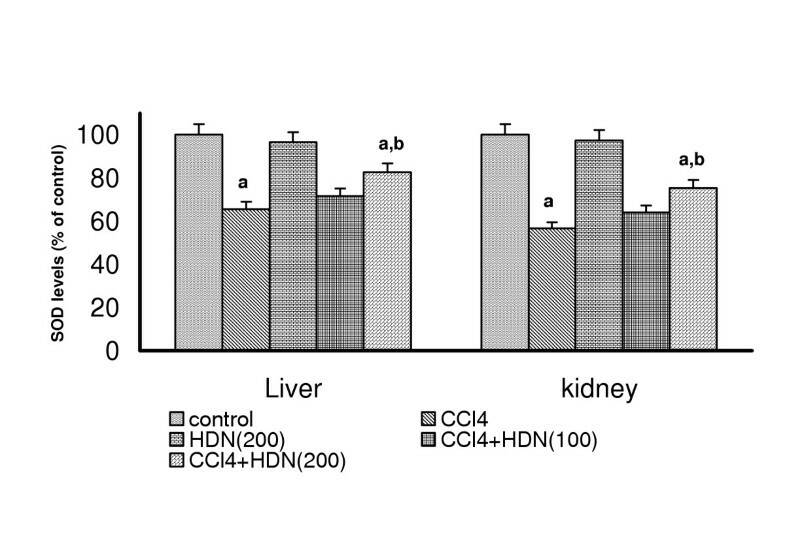 HDN administration ameliorated the increased level of lipid peroxidation after CCl4 treatment. Interestingly, only the higher dose of HDN (200 mg/kg) was able to show improvement in the levels of endogenous antioxidant enzymes (SOD and catalase) and GSH in liver. Improvement of hepatic GSH levels in HDN-treated rats in comparison to CCl4 intoxicated rats demonstrates the antioxidant effect of HDN. We failed to observe any effect of CCl4 on renal function. Neither BUN nor serum creatinine levels increased after CCl4 administration (data not shown). Studies by Zimmerman et al  also did not report any rise in BUN levels even after chronic treatment of CCl4 in nephrectomized rats. They found an increased frequency of glomerulosclerosis and tubulointerstitial alterations in rats with reduced renal mass on CCl4 administration thereby indicating nephrotoxicity on long-term CCl4 administration in rats. These findings raise the possibility that renal disease in man is related to hydrocarbon solvent exposure and may also be potentiated by concomitant renal disease or impaired renal function. Ogawa et al  also reported that chronic renal injuries and BUN elevations developed in Balb/c mice only after 12 weeks of CCl4 intoxication. On the contrary, we estimated the renal function just after 48 hrs of CCl4 challenge. Thus this brief period might not be sufficient to demonstrate any rise in serum BUN and creatinine levels. Though renal function did not alter after 48 hrs of CCl4 administration but even this short period of exposure led to a significant oxidative stress in kidneys. Fadhel and coworkers  had also reported increased levels of renal TBARS in rats after CCl4 exposure which could be improved by black tea extract. Similar observations were also reported with certain Indian ayurvedic Indian preparations . HDN treatment has been previously demonstrated to improve GSH levels in liver and kidneys of diabetic rats and a decrease in levels of 8-hydroxydeoxyguanosine (8-OHdG), a marker of DNA fragmentation, in the urine of diabetic rats . HDN in combination with Diosmin has also been shown to inhibit the reactive oxygen radicals production in Zymosan-stimulated human polymorphonuclear neutrophils . Thus HDN has been shown to reduce oxidative stress in various in-vivo and in-vitro studies. In conclusion, our study demonstrated that CCl4 induces a marked oxidative stress in rat liver and kidney, which is amenable to attenuation by HDN. This protective effect of HDN can be correlated directly to its antioxidant property. Male wistar rats (150 g–200 g), bred in the central animal house of Panjab University (Chandigarh, India) were used. The animals were housed under standard conditions of light and dark cycle with free access to food (Hindustan Lever Products, Kolkata, India) and water. The experimental protocols were approved by the Institutional Ethical Committee of Panjab University, Chandigarh. Chemicals employed in these studies were reagent grade. Carbon tetrachloride (E Merck, India) was administered subcutaneously in olive oil Hesperidin (Sigma chemical USA) was suspended in 0.5% sodium carboxy methyl cellulose (CMC) and administered orally. Animals were divided into following groups, each containing 6–8 animals: Control: These animals received a vehicle for HDN (i.e. CMC) by oral route for eight days and on 8th day, they were administered the subcutaneous injection of olive oil. CCl 4 group: These animals received vehicle for 10 days and were challenged with CCl4 2 ml/kg/s.c. (40% v/v in olive oil) on 8th day. In the preliminary studies done in our lab, we observed a very high mortality rate (50–60%) when CCl4 was administered interaperitoneally. Thus we adopted the subcutaneous route of CCl4 administration as reported in the literature . With this route and dose of CCl4, the mortality rate reduced to about 20%(1-2/8 animal) HDN group: These rats received only HDN 200 mg/kg/p.o. daily for 10 days CCl4+ HDN (100): Rats received HDN continuously for 8 days. On eight day just after HDN treatment they received CCl4 2 ml/kg/s.c in olive oil. HDN was further continued for 2 more days. CCl4+ HDN (200): This group is similar to the above one except that the dose of HDN administered was 200 mg/kg/p.o. On the 10th day, animals were sacrificed 2 hr, after the last dose of HDN and blood was collected, by carotid bleeding, in centrifuge tubes. Serum was separated and was used freshly for the assessment of renal and liver function tests. Both the kidneys and the liver were quickly harvested and immediately stored at -20°C till further biochemical estimations. Before sacrifice, rats were kept individually in metabolic cages for 24 h to collect urine for estimation of renal function. Serum samples were assayed for blood urea nitrogen (BUN), urea clearance, serum creatinine & creatinine clearance by using standard diagnostic kits (Span Diagnostics, Gujarat, India). Serum alanine aminotransferase (ALT) and serum aspartate aminotransferase (AST) were estimated by International Federation of Clinical Chemistry  (ERBA test kits). Serum bilirubin was estimated by Diazo method  (ERBA test kits). Kidneys and liver were, perfused with ice cold saline (0.9% sodium chloride) and homogenized in chilled potassium chloride (1.17%) using a homogenizer. The homogenates were centrifuged at 800 g for 5 minutes at 4°C to separate the nuclear debris. The supernatant so obtained was centrifuged at 10,500 g for 20 minutes at 4°C to get the post mitochondrial supernatant which was used to assay catalase and superoxide dismutase (SOD) activity. The malondialdehyde (MDA) content, a measure of lipid peroxidation, was assayed in the form of thiobarbituric acid reacting substances (TBARS) by method of Okhawa et al. Briefly, the reaction mixture consisted of 0.2 ml of 8.1% sodium lauryl sulphate, 1.5 ml of 20% acetic acid solution adjusted to pH 3.5 with sodium hydroxide and 1.5 ml of 0.8% aqueous solution of thiobarbituric acid was added to 0.2 ml of 10%(w/v) of PMS. The mixture was brought up to 4.0 ml with distilled water and heated at 95°C for 60 minutes. After cooling with tap water, 1.0 ml distilled water and 5.0 ml of the mixture of n-butanol & pyridine (15:1 v/v) was added and centrifuged. The organic layer was taken out and its absorbance was measured at 532 nm. TBARS were quantified using an extinction coefficient of 1.56 × 105 M-1/cm-1 and expressed as nmol of TBARS per mg protein. Tissue protein was estimated using Biuret method of protein assay and the TBARS content expressed as nanomoles per milligram of protein. Reduced glutathione (GSH) in the kidneys and liver was assayed by the method of Jollow et al . Briefly, 1.0 ml of PMS (10%) was precipitated with 1.0 ml of sulphosalicylic acid (4%). The samples were kept at 4°C for at least 1 hour and then subjected to centrifugation at 1200 g for 15 minutes at 4°C. The assay mixture contained 0.1 ml filtered aliquot and 2.7 ml phosphate buffer (0.1 M, pH 7.4) in a total volume of 3.0 ml. The yellow colour developed was read immediately at 412 nm on a spectrophotometer. SOD activity was assayed by the method of Kono et al. The assay system consisted of EDTA 0.1 mM, sodium carbonate 50 mM and 96 mM of nitro blue tetrazolium (NBT). In the cuvette, 2 ml of above mixture, 0.05 ml hydroxylamine and 0.05 ml of PMS were taken and the auto-oxidation of hydroxylamine was observed by measuring the absorbance at 560 nm. Catalase activity was assayed by the method of Claiborne et al . Briefly, the assay mixture consisted of 1.95 ml phosphate buffer (0.05 M, pH 7.0), 1.0 ml hydrogen peroxide (0.019 M) and 0.05 ml PMS (10%) in a final volume of 3.0 ml. Changes in absorbance were recorded at 240 nm. Catalase activity was calculated in terms of k minutes-1. Results were expressed as mean ± SEM. The intergroup variation was measured by one way analysis of variance (ANOVA) followed by Fischer's LSD test. Statistical significance was considered at p < 0.05. The statistical analysis was done using the Jandel Sigma Stat Statistical Software version 2.0. The grants from University Grants commission for conducting the study is gratefully acknowledged. The authors also like to express their thanks to Ms Saraswati Gupta, Senior Technical officer, University Institute of Pharmaceutical sciences Panjab University Chandigarh for her help in conducting the spectrophotometric analysis. Naveen Tirkey, Sangeeta Pilkhwal and Anurag did all the biochemical estimations in kidney and liver. Kanwaljit Chopra did the data interpretation after statistical analysis and contributed in manuscript preparation.